When it comes to indoor comfort, the performance of your heating, ventilation and cooling system is only part of the equation. Even with a top quality HVAC system, your home can still be drafty and uncomfortable (and expensive to heat or cool) if it lacks sufficient insulation. Insulation services the important role of slowing the flow of air between the interior and exterior of a building, keeping it cooler in the summer months and warmer in the winter. Many homes and in the area are not properly insulated. The HVAC experts at Barone's Heat & Air, LLC can evaluate the insulation quality and quantity in your home and provide suggestions to enhance your comfort and quality of living, while lowering your monthly utility costs. We have been providing insulation services to local residents for over 10 years, and will be happy to schedule a free consultation of your home's insulation. Call (417) 232-0017 to get started. Proper insulation is important, whether you live in a predominantly warm or cool climate. A well-insulated home will stay cooler longer, between cycles when your air conditioning is running. You'll get less of that "hot again/cold again" problem that occurs when cooled air escapes through windows and your attic. In the winter, insulation will maintain your home in a cozy state, while decreasing your heating bills. An inexpensive solution to the symptoms listed above, after the initial investment of replacing or adding insulation to your home, whether in the walls or attic, will lower your heating and cooling costs, month after month, year after year. Barone's Heat & Air, LLC provides simple solutions for drafty homes with our insulation services. When you are ready to increase the comfort of your home, call the HVAC pros at (417) 232-0017. 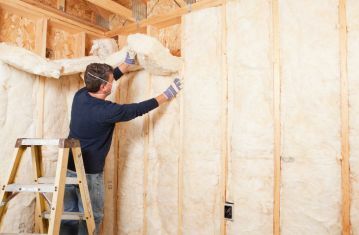 Barone's Heat & Air, LLC offers complete insulation services for new construction and and existing homes. We are well versed in the installation a variety of insulation materials, including blown in cellulose and blown-in fiberglass insulation. Our team of insulation experts can help you select the best products for your needs. Our effective our blown-in insulation process reduces the amount of labor and time required, which saves you money on installation costs.